1. A World Title Boxing contest took place in New York (75°W time zone) on a Tuesday between 21.30 and 22.30 hours and was televised live. When did viewers in Lagos (15⁰E time zone) watch the contest live on television? E. Tuesday between 02.30 and 03.30 hours. 2. Which of the following areas is subject to frequent earthquakes? 3. 'Very large in area but very low in population" Which of the following countries fits this description best? 4. The cloud which is closely associated with thunderstorms is ___. 5. Which of the following landforms results from wind deposition? 6. One major feature of manufacturing in West Africa is that the industries ___. 7. A desert country which has a high population density supported by irrigation is ___. 8. The region of the rainfall pattern is ___. 9. The climatic data above is likely to be that of ___. 10. Which of the following minerals is produced in Niger Republic? 11. The speed of wind is usually measured using ___. 12. When the temperature at sea level is 10°C, what is the temperature of the air at a height of 200 metres above sea level? 14. If a map at a scale of 1:50 000 is reduced by half what is the scale of the new map? 15. One of the following countries produces more rice than the others. Which is it? 16. A ship’s radioed message on the high sea at 5.45 p.m. was heard at Abidjan (5°W) at 11.15 a.m. on the same day. Find the position of the ship. 17. Chemical weathering processes include all except ONE of the following ? 18. A deflation hollow is produced by ___. 19. Akosombo dam is on the ___. 20. A line joining points of equal atmospheric pressure on a map is called an ___. 21. Which of the following is NOT a product of river deposition? 22. Which of the following countries has a large number of people of African descent? 23. The contents of a Stevenson's screen include thermometer and ___. Use the Map for Question 24 to 28. 24. The highest point above mean sea level in the region is just above ___. 25. Which of these triangulation stations is not visible from the edge of the quarry? 26. The landform between River Oni and the Kedi- Ibaga road is a ___. 27. 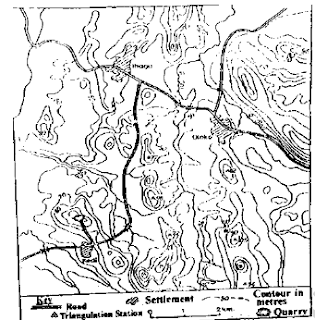 The settlements in the area mapped are located mainly on the ___. 28. The settlement pattern is best described as ___. 29. Which of the following factors is Least important in the location of industries? 30. Petroleum is usually abundant in ___. 31. One of the places noted for irrigation agriculture in Africa is the ___. Use the Map below to answer questions 32, 33 and 34. 32. Which of the ocean currents on the map is the Benguela current? 33. 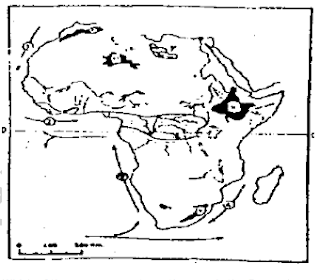 The Ahaggar Plateau is the shaded area marked ___. 34. The shaded area marked V on the map are ___. 35. Which of the following landforms originates from aeolian erosion? 36. The most important catalyst in the growth of major cities of the world today relate to developments in ___. 37. The two darns found in the upper- and lower Nile respectively are ___. 38. The most dreaded pest in the Cotton Belt of the USA is the ___. 39. A town that is situated where two rivers meet is a ___. 40. The most densely populated river delta in Africa is the ___.